This is the first spring I've had onions in the garden, thanks to fellow gardeners Albertino and Juan, who passed along a few of their extras. Right now the plants are swelling with these buds that have water trapped inside. Each little pod looks like a work of art. Gardeners and nature lovers share their photos on Green Thumb Sunday. See who else is participating. Beautiful! My onions are just tiny shoots poking up. I am definitely jealous!! I love your picture. No wonder you are a finalist in best photography! What a fantastic image - at first I thought it was an abstract watercolor. Green Thumb Sunday is a great idea - I'd love to contribute next Sunday. Wow...Christa...what an incredible shot! Gorgeous -- and awfully interesting, to boot. Wow that's a remarkable photo. I bet you'll enjoy those onions. What a fantastic photo! Taking pictures sure makes us notice nature more! Your wonderful photo has turned the most mundane plant into a work of art! Intersting, my onions look the same these days and I am looking forward to see them in bloom soon! They will look terriffic (and those blooms are so very cheap, too). Hi, Just to let you know that Along with "Mytinyplot" & "Mikes Allotment Diary" your blog was name-checked in the Sunday Telegraph newspaper in the UK today by Alex Mithcell, in her column "The Kitchen Garden Graduate". Beautiful picture! I've never grown onions before. So you have any onion-growing tricks? I mean, DO you have any onion-growing tips? Man, I can't spell today. Sorry for the typo. What an amazing photo! Hope you're having a great GTS! 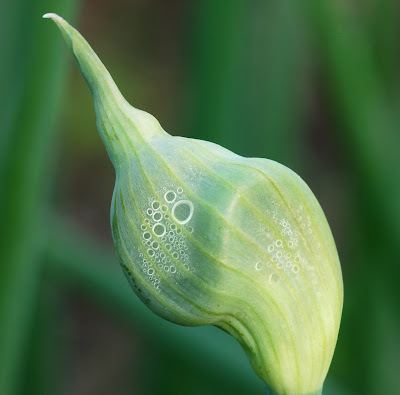 I would never have guessed that this photograph was of an onion. It is quite amazing to see the water droplets inside. You have a knack fro transforming a simple into a sublime plant! Everyone, Thanks for stopping by on Green Thumb Sunday! Greenmantle, thanks for letting me know about the article in the Sunday Telegraph. I wouldn't have known about it otherwise. I'll have to see if I can get a copy from the author. These onions were so simple to grow. I got a few young onions from other gardeners and just planted them in the ground. I added compost periodically and kept them weeded, but that's about it. No fertilizer or anything. No problems with pests. I planted them late last summer and they overwintered. Last year I grew scallions from seed and they didn't require much maintenance either. Good luck with yours! Lovely photo. Great composition. Certianly makes me feel like growing onions! Hello - I have been really enjoying looking at your blog over the last couple of days - would you mind if i linked to it from mine to remind me to check it out a bit more often? I really liked the photo of the dandelion from the book you recommended. Yes, feel free to add a link. Anyone who wants to link here is welcome to do so. All text and photos on Calendula & Concrete, unless otherwise noted, are by Christa Carignan (© 2006-2010 Christa Carignan). All rights reserved.